This image of the Milky Way was taken by amateur astronomer Scott MacNeill from Frosty Drew Observatory in Charlestown, Rhode Island. A night of stargazing in Rhode Island proved to be quite magical for one night sky photographer. 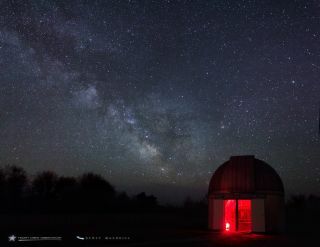 Astrophotographer Scott MacNeill of Frosty Drew Observatory in Charlestown, Rhode Island, captured these images of the bright Sagittarius Arms and galactic center of the Milky Way on May 3. This image of Saturn was taken from Frosty Drew Observatory in Charlestown, Rhode Island by amateur astronomer Scott MacNeill. The same day he was able to capture the observatory's first view of Saturn for the 2014 observing season. The image showcases the increased axial tilt of the planet with a defined Cassini Division. The Cassini Division is the large gap between the two most prominent of Saturn's rings — Rings B and A — caused by the gravitational pull of the moon Mimas.